At what point does an homage become a rip-off? Super 8 isn’t the best movie ever made. It introduces no new ideas regarding sci-fi or aliens or monsters and neither does it break new ground regarding plot or special effects. But Super 8 captures that feeling of being young. And specifically, being young and pretending to be an adult. For those of us that grew up on Goonies, E.T. and Stand By Me, Super 8 takes us back; drawing a very thin line between adulthood and childhood. Sometimes it takes the children to teach the adults. Sometimes it takes the children to save the day. Super 8 takes the best thing about being young and reminds us what it’s like to be that way again. You’ve heard it said and will hear it again that Super 8 is nostalgic. Well, that’s true. There’s no agenda, there’s no hidden message. There’s absolutely nothing behind this film except a director who is desperate to help us remember what it’s like to be a kid. However, the film gets rocky when other added elements come into play and derail it a bit. 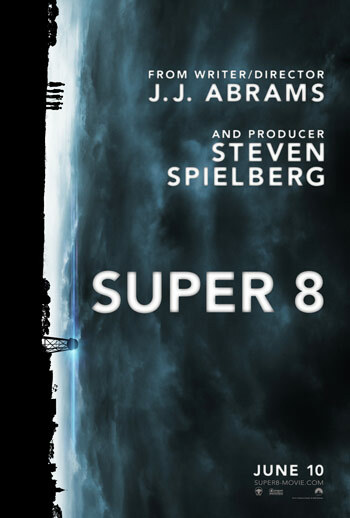 Super 8 is about the growing up of a young boy, Joe Lamb (Joel Courtney), who has just lost his mother at a point in his life where it seems he needs her most. The death of his mother seems to have created a chasm between himself and his father…or at least exposed it. Here the film seems to impose upon us the tiny subplot of the two fathers, Jackson Lamb (Kyle Chandler) and Louis Dainard (Ron Eldard), of the main characters, Joe and Alice (Elle Fanning), Jackson and Louis overcome their very troubled and strained relationship all in the name of their children. There being a rather deep-seeded hatred between the two involving the death of Joe’s mother, this resolution feels rushed and unrealistic. Also, the film tries to shoe-horn in this brow-furrowing storyline involving an alien. Whether accidental or on purpose, the alien looked strikingly similar to the Cloverfield monster, a film which Abrams produced. This alien aspect of Super 8 also seemed a bit unoriginal. All the alien wants to do is go home and when the alien touches a human an immediate understanding flows between the two of them. We’ve seen this before, but this does not feel nostalgic at all. It feels copied. It goes from having a throwback, “Golden Age” feeling (wink, wink) to a paint-by-number scheme. I can’t help but think about the line from Chasing Amy, “You’re a tracer”. If the film were simply about the kids, then it would have been much better. Abrams gave us hints and resemblances to older films close to the hearts of Super 8’s target audience, yet keeps in a bit of his own style. However, with the alien sequence, he seemingly lifted straight from another source. So the question becomes: At what point does an homage become a rip-off? When it stops “inking” and starts “tracing”. FilmNerds Roundtable – where myself and several other film nerds discuss their thoughts on Super 8. Cinematrimony – where my married friends, Matt and Francesca Scallici watch a movie together and discuss it.